A glory is directly opposite the sun and has a bright centre whose light is strongly polarised. These observations tell us that droplets somehow deflect light through angles of around 180º and that at least one internal reflection is involved. Simple diffraction theory fails to explain the glory or the positions of its rings. Rigorous Mie scattering theory, as used in IRIS, predicts the glory perfectly. But gives gives no clues to how it forms. Mie theory - formulated at a fundamental level from Maxwell's equations of electromagnetism - says only what happens and not how. Fortunately, a reformulation of Mie theory made by Peter Debye, reveals more. The major source of the glory's central illumination is light reflected once inside droplets. There are lesser contributions from light reflected 10, 6 and 5 times. Philip Laven provides an excellent account of the application of Debye theory to light scattering by water drops. Impossible ray path? The dotted ray with one reflection shown at upper left is impossible! Water does not refract strongly enough. The actual path, drawn as a solid line for red light, leaves the droplet 14.4º short of the demanded 180º. Paths entering the sphere in other positions also fail to explain the glory. Diffraction in small droplets eliminates the sharp ray paths but does not solve the problem. How do we explain the apparently impossible light path? We can do so by taking account of another optical phenomenon in addition to reflection, refraction and diffraction -- surface waves. The incoming ray at left grazes the droplet surface. Under these conditions it can travel along the rim as a "surface wave" before being refracted. At the internal reflection the grazing incidence condition still holds and the reflection can be delayed. A third delay can take place as the light exits. 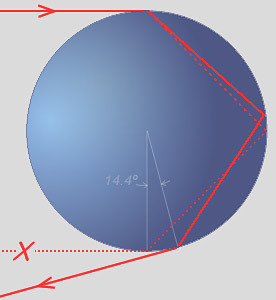 The surface waves are shown schematically at left as red dotted lines. 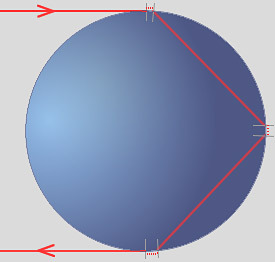 Surface waves are strongest for light at grazing incidence, i.e.when the ray shown at right is refracted so that it would leave the denser medium parallel to the surface. The surface wave can, after a delay, form a displaced and weaker internally reflected beam. Surface waves decay very rapidly but for a 10µm dia. droplet the total path length required is less than 1µm or 1-2 wavelengths. There are other interpretations. Any mystery is of our making in that we often seek explanations for the world in terms of our everyday or macro experience and these do not exist for the glory. Nonetheless, the physics of Maxwell is fully able to account for it.